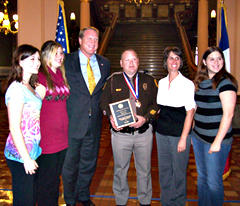 Trooper Todd Souhrada and his family pose for photos with Governor Culver. Governor Chet Culver presented the Sullivan Award to 11 Iowans today. It’s the state’s highest civilian honor. One of the Sullivan Award winners is a state trooper who spotted the massive tornado headed to Parkersburg in May of 2008 and wound up risking his own life to save people trapped in the rubble. Trooper Todd Souhrada first saw the tornado east of Ackley. “I watched it touch down, was able to call in and get the tornado emergency alarms off so that people could take cover and I basically chased it into Parkersburg,” Souhrada says. So Souhrada and the volunteer fire fighters started removing debris and jacked up a beam in the house that was holding up part of the floor. Once she was free, the debris crashed down on Souhrada. “It hit me in the back and busted away a couple of ribs from my spine, so I was laid up for five months,” Souhrada says. The gas line to the house had ruptured and Souhrada was very close to the source. Yet Souhrada says none of the rescuers thought twice about leaving and stuck with their task. Souhrada himself kept working for hours more that day, despite his injuries. Souhrada nominated the fire fighters who assisted in the rescue and three volunteer fire fighters from Allison and one from Aredale received Sullivan Awards today as well. Souhrada’s boss secretly nominated him for the award, too. Souhrada says he was just doing his job. Souhrada’s family came to Des Moines for today’s ceremony. His pastor, Scott Summers of the Bethel Reformed Church north of Aplington, isn’t surprised by Souhrada’s heroism. A large crowd was on hand for today’s ceremony in the statehouse. Officer Jeremy Stevenson of the Grinnell Police Department was surrounded by family and co-workers after he received the Sullivan Award medal this morning for crawling into a burning home and rescuing the elderly woman trapped inside. Read more below about these two Sullivan Award winners and the nine others who were honored. DES MOINES –Governor Chet Culver presented 11 Sullivan Brothers Awards of Valor at a special ceremony today in the rotunda of the State Capitol. 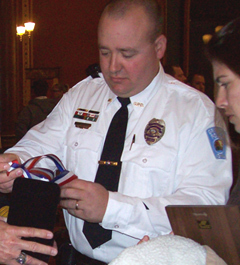 The awards were bestowed upon sworn peace officers and firefighters for their efforts in saving the lives of their fellow Iowans. The Sullivan Brothers Award of Valor program recognizes peace officers and firefighters who, while serving in an official capacity, distinguished themselves by the performance of a heroic act above and beyond the normal demands of police or fire service. The peace officer or firefighter was also fully aware of the threat to his or her personal safety. Officers and firefighters receiving the 2009 Sullivan Brothers Award of Valor work for the following law enforcement agencies or fire departments: Jones County Sheriff’s Office, Allison Volunteer Fire Department, Aredale Volunteer Fire Department, Iowa Department of Public Safety/Iowa State Patrol Division, Grinnell Police Department, Bremer County Sheriff’s Office, Waverly Fire Department and the Louisa County Sheriff’s Office. On April 23, 2008, Deputy Brian Eckhardt and Deputy C.J. Sullivan jumped into a cold flooded creek and while fighting the strong current, with zero visibility in the water and a submerged upside-down vehicle, they were able to work as a team and locate and remove toddler Tatum McGlothlin from the vehicle. Prior to the arrival of Deputies Eckhardt and Sullivan, a citizen, Robert Bierer, had already removed two additional children from the vehicle. However, he was not able to locate Tatum McGlothlin. The actions of Deputies Eckhardt and Sullivan probably saved the life of Robert Bierer as well, since he had spent approximately 6-7 minutes in the freezing water and was fatigued when they arrived on the scene. Robert Bierer was given the Governor’s Lifesaving Award in 2008. The Commendation Committee decided unanimously that Deputy Brian Eckhardt and Deputy C. J. Sullivan are deserving of the Sullivan Brothers Award of Valor for their heroic actions which resulted in saving the life of two-year old Tatum McGlothlin of Anamosa. On Sunday, May 25, 2008, in the wake of an EF-5 tornado that moved through the community of Parkersburg, Iowa, Fire Fighters Brad Cooper, Brett Cooper, Donald Scroggin, Assistant Fire Chief Dustin Cole, and Trooper Todd Souhrada risked their own personal safety to remove debris and rescue Dana and Karen Anderson (brother & sister) who were trapped under debris from their home at 712 3rd Street in Parkersburg, Iowa. These men worked to save these individuals regardless of the instability of the residence/structure they were working in. The presence of natural gas and the hazardous debris field made it very dangerous for the rescue workers. These men continued their rescue efforts throughout the night even though Trooper Souhrada sustained injuries to his back, leg and lungs from breathing the natural gas during the rescue efforts at the Anderson residence. The Commendation Committee decided unanimously that all the officers nominated are deserving of the Sullivan Brothers Award of Valor for their heroic acts which resulted in saving several lives. On October 12, 2008, Grinnell Police Officer Jeremy Stevenson, while on routine patrol, was called to a house fire at 513 4th Avenue, Grinnell, Iowa. Upon his arrival he found four (4) persons on or near the front door of the house. Officer Stevenson could see heavy amounts of smoke coming from all areas of the house. There were also flames showing near the rear of the house. Officer Stevenson arrived minutes before the Grinnell Fire Department. Officer Stevenson immediately got all the occupants away from the front of the house and began asking if everyone was out. Lindsay Etter appeared to have been the last one out and told Officer Stevenson that her elderly grandmother was still in the house. Lindsey Etter had tried to rescue her grandmother, Dorothy Delk from the house, but her grandmother had fallen and Lindsey was overcome with smoke and was coming out the front door for air when Officer Stevenson arrived. Officer Stevenson had experience in fire situations, and dropped to a crawling position and entered the house to locate Ms. Delk. Upon entering the front door Officer Stevenson crawled 6-8 feet and located Ms. Delk lying face down. Officer Stevenson pulled her towards the door, then picked her up and carried her to safety. Grinnell Fire department was on scene by this time as well as medical personnel. The Commendation Committee decided unanimously that Officer Jeremy Stevenson is deserving of the Sullivan Brothers Award of Valor for his heroic acts which resulted in saving the life of Dorothy Delk, 88. On October 21, 2008, Deputy Sean Hartman and Fire Fighter Jim McKenzie arrived at a house fire at approximately 3:56 a.m. As Deputy Hartman and Fire Fighter McKenzie approached the engulfed home they were advised by Bradley Hedrick that his grandmother Luetta Ohlendorf was still in the house. Hedrick said the back door on the northwest side of the house was locked and we would have to try and get in through the front door. Deputy Hartman and Fire Fighter McKenzie went to the east side of the residence and opened the north door which was located on a deck. This door was not locked. When the door opened fire and smoke came out of the door. Both men got onto their hands and knees and tried to enter the residence. Unfortunately, due to the heat they were unable to enter through this door. McKenzie and Hartman went to a second door just to the south. Hedrick advised that Ohlendorf was just on the other side of the door in a chair. This door was locked, so the men kicked the door several times until it broke open. When the door opened fire, smoke, heat, and debris knocked McKenzie and Hartman to the ground. At this time the deck could no longer support their weight, so the men jumped over the railing and went to the window on the east side of the residence. They could see Luetta Ohlendorf walking toward the window. Ohlendorf was covered in fire. Hartman gave his ASP baton to McKenzie so he could break out the window. Hartman ran to his patrol car and grabbed his fire extinguisher. When Hartman returned to the window Ohlendorf was trying to climb out the window, she had her hands and part of her head past the window. Ohlendorf was completely covered in fire and there was no place for us to grab to pull her out. Deputy Hartman pulled the pin on the fire extinguisher and was going to try and knock down some of the flames around the window. As Deputy Hartman tried to squeeze the trigger on the fire extinguisher a large explosion occurred throwing both men to the ground. The explosion appeared to come from the area where Ohlendorf was. Unfortunately, Deputy Hartman and Fire Fighter McKenzie’s rescue attempts were unsuccessful and Ms. Luetta Ohlendorf died in this house fire. The Commendation Committee decided unanimously that Deputy Sean Hartman and Fire Fighter Jim McKenzie are deserving of the Sullivan Brothers Award of Valor for putting their lives in danger to attempt to rescue Ms. Luetta Ohlendorf. On March 15, 2009 at approximately 3:30 p.m., the Louisa County Sheriff’s Office received a 911 call of someone on the Iowa River Bridge. The caller stated that the person was on the outside of the rail and thought someone should check out the situation. Deputy James Clasen, Chief Deputy Adam Caudle and Trooper Allen Konecne responded to the scene. Caudle proceeded to the east side of the bridge while Clasen stopped by the person on the bridge, exited his car and attempted to speak with the person. The person turned toward Clasen, with her back to the river, raised a hand in a “wait a moment” gesture and fell backwards off the bridge and into the river. The river at that point was at the 20 foot flood stage and was approximately 40 degrees. Chief Deputy Caudle then returned to the west side of the river and went downstream as Clasen stayed on the bridge and acted as a spotter. Caudle got ahead of the jumper, went down the bank from the parallel road, removed his boots and gun belt and entered the flooded river and tried to get close enough to the victim to rescue her. This rescue attempt was unsuccessful. Chief Deputy Caudle returned to shore and got back in his squad car and drove further down the river to the boat landing where he again entered the river and was able to successfully get the victim and return her to the shore and awaiting ambulance. Chief Deputy Caudle made this rescue in spite of the flood stage and temperature of the river. His decision to return to shore after the first attempt was made due to his inclement weather training received in his 20 years in the Marine Corps. Had it not been for that decision, the task would have been a body recovery rather than a successful rescue. The Commendation Committee decided unanimously that Chief Deputy Adam Caudle is deserving of the Sullivan Brothers Award of Valor for his heroic acts which resulted in saving the life of Diane Yotter.